Dayananda Ashram Rishikesh is situated on the banks of the Holy Ganga, away from the major tourist attractions. It is a unique centre for the study of Vedanta and Sanskrit; unique in the sense that the classes are conducted in English yet the adherence and reverence to the ancient tradition of teaching (Sampradaya) is total. There is a temple dedicated to Lord Siva as Gangadharesvara facing the Ganga. The main lecture hall also faces the Ganga. There is a library with more than 5000 titles on various subjects, i.e. Vedanta, Sanskrit Grammar, Indian and western philosphies, Religion and Yoga. There is also a Yoga studio where regular Iyengar Yoga camps are conducted. The ashram was established during the 1960s by Swami Dayananda Saraswati, who is an internationally recognised teacher of Vedanta and foremost scholar of Sanskrit. Swamiji and his disciples conduct regular residential courses at the ashram with the focus on Bhagavad Gita and the ten principal Upanishads as commented upon by Adi Shankaracharya. These and selected ancillary texts are analysed and taught along with Sanskrit grammar in the Paninian style. Vedic chanting is also taught during courses. In addition, throughout the year, a resident acharya holds daily discourses on the Upanishads, incorporating analytical examination of Adi Shankaracharya's commentaries. Dayananda Ashram is the parent Vedanta institute of the Arsha Vidya Gurukulam group, established by Swami Dayananda. Known as Arsha Vidya Pitham it means a centre of learning based on the teaching of the ancient rishis. 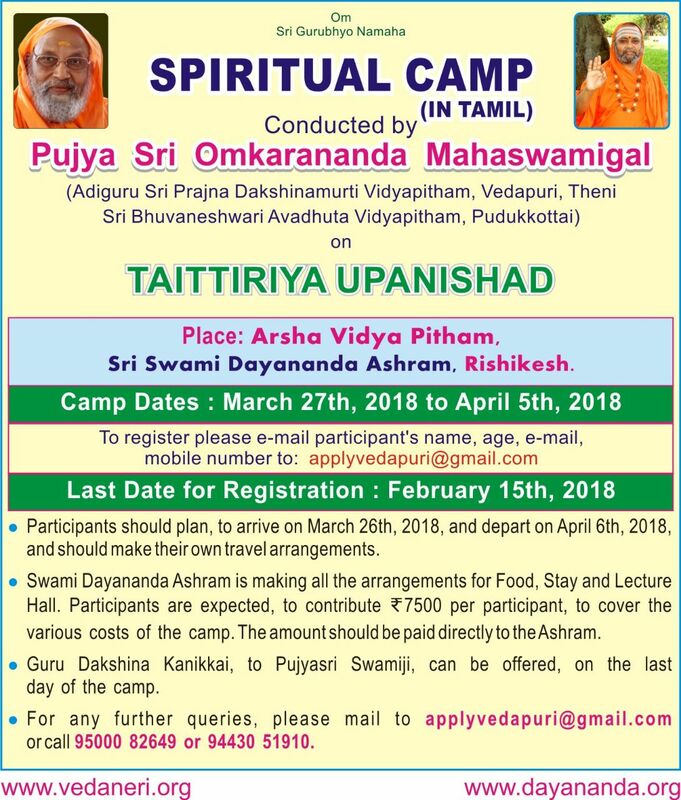 Registered with Swami Dayananda ashram?